Tyrompiskota (pronounced Tee-roh-mpi-SKOH-tah) literally mean cheese biscuits. I made them based on other shortbread cookies I have made in the past by adding cheese and spices. Tyrini Sunday is the last day before the Easter fasting period which also marks the end of the carnival. Therefore no meat is eaten but during the whole week before Tyrini it is a tradition to eat anything with dairy products, especially cheese and eggs in order to prepare for the great Lent. In Cyprus the last day before the fasting for Christmas (14th November) and Tyrini, before Easter are called “sikoses”. Sikoses, from the verb σηκώνω = sikono, which means “to lift” because it is the last day of “Apokries” or carnival, which both mean, abstaining from eating meat. In this cake “sikoses” means lifting non-Lenten food from our tables. On this day it is a tradition in our house to make Cypriot Ravioles, as my mother did and I continue the tradition because my family love them and who wouldn’t love hand made pasta, filled with halloumi and mint? I made these savoury cookies two years ago again on Tyrini, which is today. They are very easy to make and taste amazing. I added two of my favourite cheeses, halloumi and graviera and a combination of various spices and herbs on top, which made them disappear in no time. Tyrompiskota (pronounced Tee-roh-mpi-SKOH-tah) literally mean cheese biscuits. I made them based on other shortbread cookies by adding cheese and spices to them. Put both cheeses and 1 cup of flour and salt in a bowl and mix to combine. Add butter and mix with your hands. Add the egg yolk, mix and then add the remaining half cup of flour gradually until the dough holds together. If necessary add some cold water, a tablespoon at a time until the dough holds together. Make it into a roll, wrap in cling film and refrigerate for half an hour. Cut them into thin slices with a sharp knife. Place them on parchment paper, sprinkle tops with spices and refrigerate again. Preheat oven to 180 o C / 350 o F and bake for 15 – 20 minutes until firm and lightly browned around edges. Those cookies look wonderful! A terrific snack. Perfect with a glass of white wine. WOw cookies was one the best for breakfast and this this cookies are really amazing. looks really taste..
Love the savory biscuits! You got all the perfect herbs on there too. Wish you were my neighbor. savory cookies..yummy!! A big tray would be great for sunday brunch! What a great day–to feast on cheese-filled pastries! The tyrompiskotat look delicious with the spices and herbs on top. Thanks for the yummy savory idea, Ivy. And congrats on the ebook!!! These would be way to dangerous to have around. I cannot resist savoury biscuits, and these look scrumptious. Ivy, I can almost taste this savory cookies melting in my mouth…love the herbs and the cheese of course. Great to serve when you have guest. 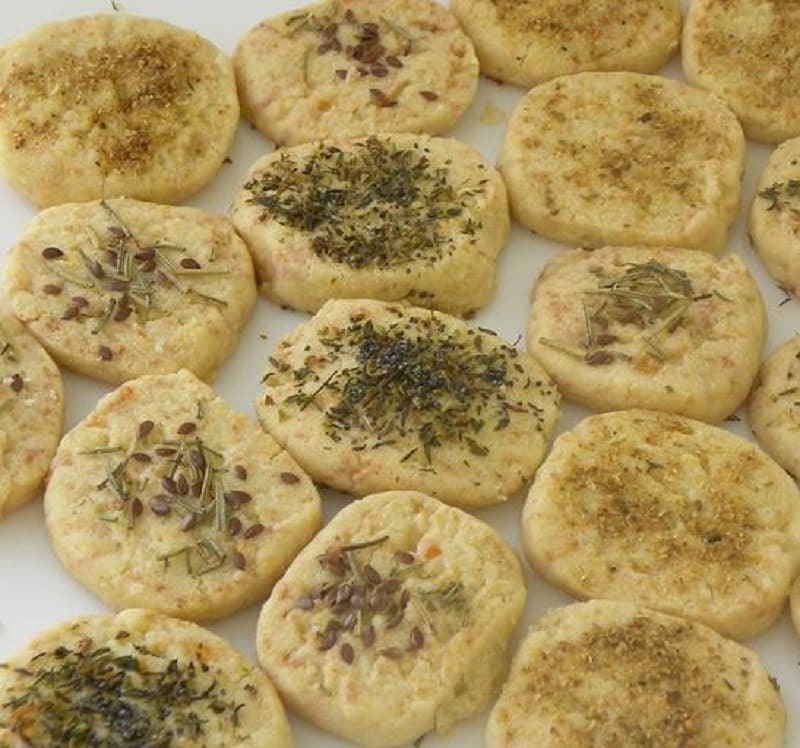 The Cheesy Savory Cookies sound scrumptious how fun to experiment with different herb/spice toppings! We were on the same wavelength: we both made savory cookies. I like the various toppings. Looks like a very intesting recipe. I always like to eat these type of savory cookies, and the cheese makes it all the more delectable.